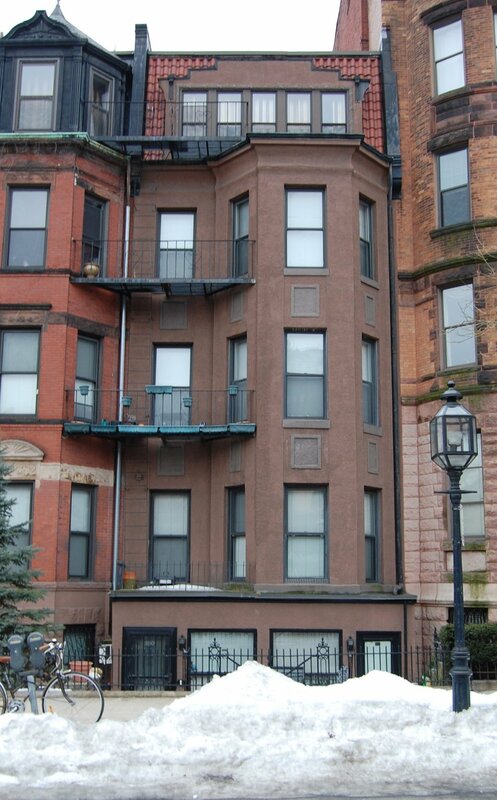 360 Commonwealth is located on the south side of Commonwealth, between Hereford and Massachusetts Avenue, with 358 Commonwealth to the east and 362-366 Commonwealth to the west. 360 Commonwealth was designed by Obed F. Smith, architect, and built in 1883-1884 by Vinal & Dodge, masons, for building contractor George Wheatland, Jr. for speculative sale. He is shown as the owner on the original building permit application, dated November 30, 1883. The house was originally numbered 358 Commonwealth until about 1889, when 328 Commonwealth was built and the houses to the west of it were renumbered. 360 Commonwealth was one of thirteen houses (336-360 Commonwealth) built for George Wheatland, Jr., by Warren D. Vinal and Charles A. Dodge on land owned by Charles Merriam and by Jacob Rogers. 336 Commonwealth was designed by George Avery, 338-340 Commonwealth were designed by Bradlee, Winslow, and Wetherell, and 342-360 Commonwealth were designed by Obed F. Smith. Charles Merriam purchased his land, with a 50 foot frontage, on October 25, 1879, from David Skillings, and Jacob Rogers purchased his land, with a 231 foot frontage to the west of Charles Merriam’s parcel, on January 19, 1880, also from David Skilllings. All of the land was part of two parcels originally purchased from the Boston Water Power Company on April 19, 1870, and December 16, 1870, by David Skillings as trustee for a trust composed of himself, Lawrence Barnes of Burlington, Vermont, Charles Whitney of Lowell, and David Whitney, Jr., of Detroit. The land had subsequently changed hands and he had re-acquired it, in his own name, on January 12, 1878. 336-338 Commonwealth were built first, in 1881-1883, on Charles Merriam’s land. On December 10, 1881, after 336 Commonwealth was completed, Charles Merriam sold George Wheatland, Jr., the house and land, together with the remainder of his land to the west. On the same day, George Wheatland, Jr., sold 336 Commonwealth and the 24 foot lot at 338 Commonwealth to Warren Vinal and Charles Dodge. He retained the two feet to the west. Warren Vinal and Charles Dodge sold 336 Commonwealth in June of 1882, and sold 338 Commonwealth back to George Wheatland, Jr., in July of 1883, after it was completed. 340-360 Commonwealth were built between 1883 and 1885 on Jacob Rogers’s land. All of the building permit applications were filed by George Wheatland, Jr., in November of 1883, and the houses were constructed by Vinal & Dodge, with the houses towards the east built first. Jacob Rogers sold his land to George Wheatland, Jr., in one- and two-lot transactions between November of 1883 and January of 1885, sometimes before construction of the houses had begun and sometimes after the houses were substantially completed. 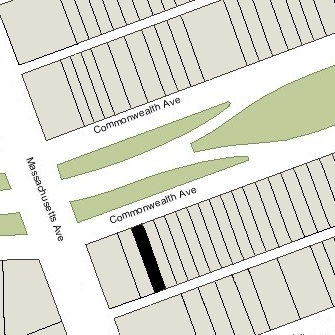 Click here for an index to the deeds for 360 Commonwealth, and click here for further information on the land on the south side of Commonwealth between Hereford and Massachusetts Avenue. 360 Commonwealth was 21 feet wide and extended one foot further west than Jacob Roger’s land. On December 4, 1883, George Wheatland, Jr., purchased a one foot strip of land from M. Woolsey Borland, who owned the land to the west, and then on September 3, 1884, he purchased the remaining 20 feet from Jacob Rogers. On May 7, 1885, 360 Commonwealth was purchased from George Wheatland, Jr., by David Boardman Flint, a retired lumber merchant. He and his wife, Elizabeth L. (Fuller) Flint, made it their home. They previously had lived in Watertown. Elizabeth Flint died in March of 1889. David Flint continued to live at 360 Commonwealth, remarrying in June of 1891 to Dr. Almena Jane (Guptill) Baker. She was a homeopathic physician and the widow of Edward A. Baker, a jeweler, who had died in June of 1889. David Flint died in July of 1903, and Almena Flint moved soon thereafter to the Hotel Somerset. On September 1, 1904, 360 Commonwealth was purchased from David Flint’s estate by Dr. James D. Robertson, a physician. He previously had lived and maintained his office at 200 St. Botolph. He married in June of 1905 to Frances J. (Greenhalge) Ross, the widow of John Ross. After their marriage, they lived at 360 Commonwealth, and on September 26, 1905, he transferred the property into her name. 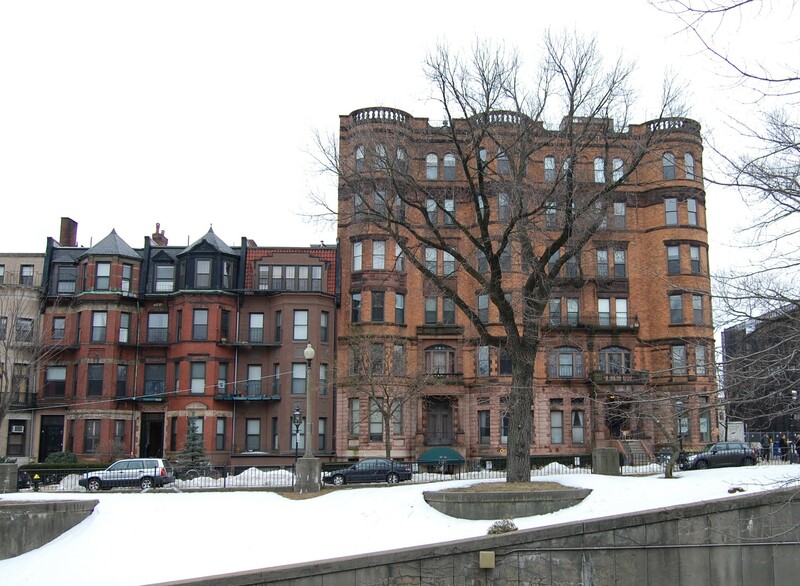 They continued to live at 360 Commonwealth during the 1910-1911 winter season, but moved thereafter to 205 Bay State Road. 360 Commonwealth was not listed in the 1912-1914 Blue Books. On April 10, 1913, 360 Commonwealth was acquired from John H. Morse by Fred L. Hewitt, trustee of the Briggs Trust. That same month, he filed for (and subsequently received) permission to convert the property from a single-family dwelling into “suites for doctors.” At the same time, he also received permission to lower the front entrance from the first floor to the street level, and also to remove the basement level bay and support the bay window above by iron columns and beams. The remodeling was designed by architects Dykeman and Murray. 360 Commonwealth changed hands and on April 2, 1928, was acquired by Dr. William Henry Gilpatric and his wife, Carolyn Draper (Nutt) Gilpatric. He was a dentist specializing in orthodontia. They lived in Winchester. The Gilpatrics also owned 356–358 Commonwealth, which they had converted into dental offices, and in April of 1928, they applied for (and subsequently received) permission to remodel the interior of 360 Commonwealth, including cutting four doors in the party wall connecting with 358 Commonwealth. The building’s use was shown as being dental offices. William Gilpatric died in March of 1938. Carolyn Gilpatric continued to own 356-358-360 Commonwealth and to live in Winchester. On April 26, 1946, 356-358-360 Commonwealth were acquired from Carolyn Gilpatric by real estate dealer Howard Stephen Cosgrove of Winchester. On February 16, 1948, 356-358-360 Commonwealth were acquired from Howard Cosgrove by Harry H. Byron. In March of 1948, he applied for (and subsequently received) permission to convert 356-358 Commonwealth from 23 dental offices into 22 dental offices and one office for medical massage and physical therapy. 356-358-360 Commonwealth changed hands and on September 4, 1960, were acquired by Hyman Goodman. By that time, each building contained dental offices and six apartments. In November of 1960, he applied for (and subsequently received) permission to convert the dental offices on the second, third, and fourth floors at 356 and 358 Commonwealth into apartment use, expanding the existing apartments (and not increasing the number of units). 356 Commonwealth subsequently had one dental office and six apartments, and 358 Commonwealth had two dental offices and six apartments. 356-358-360 Commonwealth changed hands and on June 30, 1966, were acquired by real estate dealer Michael J. Smith, trustee of Wethersfield Associates. On September 1, 1967, 356-358-360 Commonwealth were acquired from Michael Smith by Robert White. He already owned nine other buildings on the block – 324–326–328–330–332–334–336 Commonwealth, 344 Commonwealth, and 348 Commonwealth – and would acquire 354 Commonwealth in 1972 and 322 Commonwealth, 346 Commonwealth, and 350 Commonwealth in 1978. In January of 1975, he applied for permission to legalize the occupancy of 360 Commonwealth as ten apartments, which he stated had been the existing condition for a “great many years.” The application was denied but his appeal was granted by the Board of Appeal. However, he subsequently abandoned the permit. In December of 1988, he received permission to combine 356-358 Commonwealth into a single property with nineteen apartments. In February of 1989, he once again filed for permission to legalize the occupancy of 360 Commonwealth as ten apartments, and then abandoned the permit. On February 1, 1991, Robert White transferred 322-330 Commonwealth, 336 Commonwealth, 344-350 Commonwealth, and 354-360 Commonwealth to Charles White Management, Inc. He transferred 334 Commonwealth on April 8, 1999. In November of 1998, Robert White filed for (and subsequently received) permission to convert 360 Commonwealth into nine apartments and one dental office, noting that a similar application had been approved by the Board of Appeal in 1975 but then abandoned. In September of 2000, Charles White Management applied for (and subsequently received) permission to combine 356-358 Commonwealth and 360 Commonwealth into a single property consisting of 27 apartments (18 in 356-358 Commonwealth and 9 in 360 Commonwealth) and one professional office (in 360 Commonwealth). 356-358-360 Commonwealth remained an apartment house in 2018.